We are back home from the holidays and craving some easy, hearty comfort food. The fact that it's 18 degrees just adds to the craving. This risotto take care of that craving perfectly. 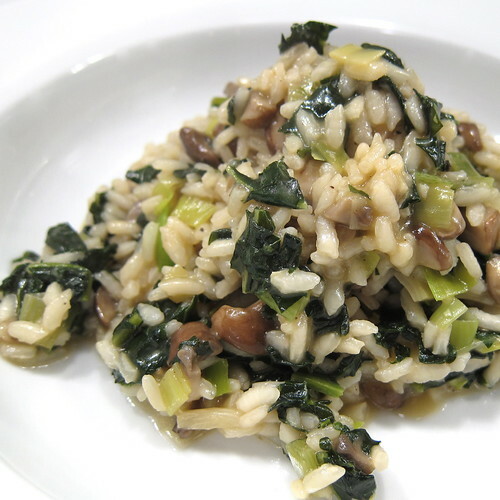 This is a dish that is just full of earthy flavors from the kale and mushrooms. The garlic is cooked slowly with the risotto and tastes almost like you roasted it. It's hearty and warming, just the thing in front of a fireplace, if you ask me. A note on the kale, we harvest kale from our garden all summer then blanch and freeze it to use in winter soups and stews. If you are using fresh kale from the store blanch it for a minute before using it in this recipe otherwise it won't be very tender. Kale is such a great winter vegetable and one of those that help keep you free of flus and colds. Put 1/2 T olive oil in a small skillet and heat over medium-high heat. Add the leek and sauté for one minute. Add the mushrooms, lightly salt and sauté another minute. Add the kale and sauté until the mushrooms are cooked and the kale is tender. Set aside. Put the chicken stock in a saucepan and bring to a simmer. Keep simmer during the cooking process. the word 'umami' comes to mind, even though i still have trouble defining it. this is a great dish! I continue to be kale crazy. This looks great and is exactly the kind of food we are in the mood for as well. In another saucepan heat the remaining 1/2 T olive oil and 1/2 T salt over medium heat. You are so right, I meant to say unsalted butter. Thanks for the catch. Made this tonight on a snowed-in New England evening and it was just the thing! I used white wine instead of sherry because I didn't have any, and scallions instead of leeks for the same reason. Delicious!